Biomarkers speak volumes for your health. What do they say about you? Biomarkers are proteins present in your blood, right now, that define your current health status. Looking at the identity and amounts of these markers paints a real-time picture that describes how healthy you are at any given moment. This is the power of the PanoHealth Wellness Management System. 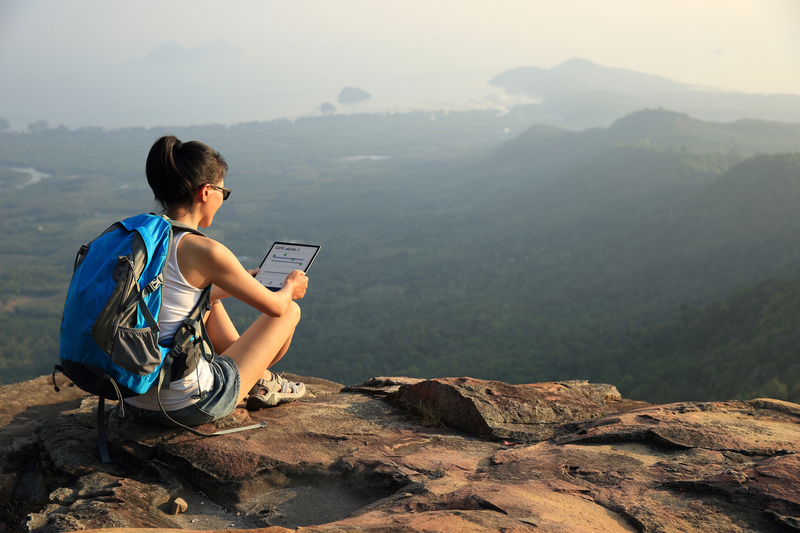 The PanoHealth Wellness Management Program assesses the evolving, real-time status of your current health and wellness using protein biomarkers. Our services are provided as an on-going analysis to be done frequently. Send us your sample using our easy-to-use blood collection kit (image below) to receive detailed biomarker analysis reports indicating your personal health baseline – with data comparing your current biomarker levels to your previous levels along with the normal population. PanoHealth uses the world’s largest panel of 1,000 protein biomarkers in order to monitor expression changes over time. The biomarkers chosen for characterization are scientifically established as accurate markers for assessing human health and wellness. This routine monitoring (every 3 or 6 months) provides you with the most comprehensive health snapshot available. Studying the results and learning more about the biomarkers enables you to have a better understanding of your current health status. Biomarker monitoring with PanoHealth’S Athletic Packages can offer a detailed analysis of key protein biomarkers for optimizing your injury recovery, detecting overtraining at early stages, maximizing your performance, tracking patterns of inflammation, and optimizing healthy weight loss. Periodic examination of these biomarker levels allows PanoHealth to determine and track your unique personal health baseline – giving you the knowledge to take control of your training. The Biomarker Analysis & Wellness Report summarizes your current state of health through the analysis of 1,000 crucial biomarkers present in your blood. 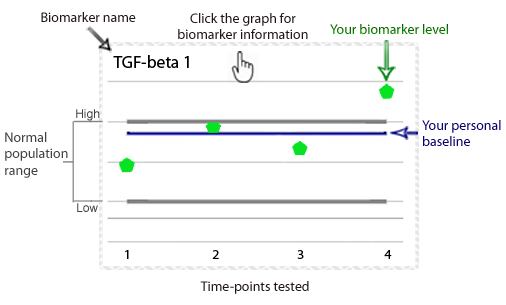 Measurement of these biomarkers over time elucidates your personal baseline for each biomarker (see blue line in graph) and indicates where you fall compared to the population normal ranges (see grey lines in graph). Once your baseline is established, it is possible to track small changes in your biomarker levels which may be indicative of big changes in your health or physiology. We are confident that if you monitor your biomarker levels closely and review the resulting analysis with your healthcare professional, you will be better informed regarding potential changes in your health and be able to determine any adjustments in lifestyle or diet that will better optimize your health status. Providing your sample and receiving your detailed report is simple and easy. 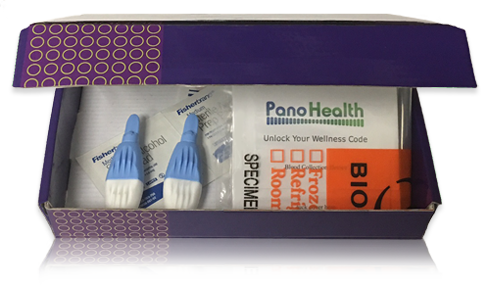 After placing your order, you will receive a PanoHealth sample collection kit with detailed instructions on how to painlessly collect your blood sample using just your fingertip. Use the prepaid shipping label to send it to our GLP-certified testing facility for processing and analysis. Samples are processed using the cutting-edge Quantibody® technology, which has been used by scientific researchers worldwide resulting in hundreds of publications on biomarker changes. Once the testing is complete, your detailed biomarker analysis report is securely placed in your customer area of this website. You can then review and download it at any time. Proteomics is the study of proteins, including biomarkers, and how they function in your body. Biomarkers can illuminate changes in your specific biological processes that indicate health changes that are often below the threshold of human perception. By quantifying the proteins in your blood you will get a real-time assessment of your current health and wellness state. PanoHealth’s on-going protein biomarker identification may identify risk many years before the onset of disease and can help you make important health decisions. Rapidly. Efficiently. Accurately. The statements made on this website have not been evaluated by the Food and Drug Administration. The PanoHealth Wellness Management System is not intended to diagnose, prognose, treat, cure or prevent any disease or medical anomaly. Please consult with your healthcare professional if you have questions or concerns regarding these services and corresponding reports or your current health status. It is also highly recommended that you consult with your healthcare professional prior to implementing any of the recommended actions contained herein.